Sounds like a dance, doesn’t it? The Kauai Poke! 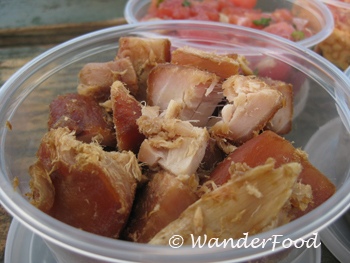 Actually, poke is a generic term to describe the way a fish is prepared (think ceviche from Central America) and is a popular dish in the Hawaiian islands. While there are many variations on this theme, poke is served raw and often includes a bit of sea salt, soy sauce, seaweed and some chili pepper. You might find it with tuna, squid, clams or any other seafood the locals can get their hands on. It seems some of the best kinds are those found in the deli section of little markets but you can find it in the larger grocery stores as well. 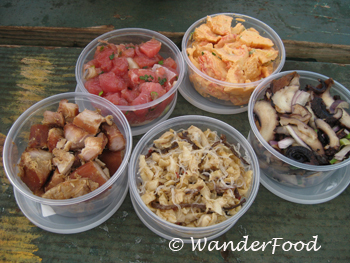 We picked up a variety (above) of pokes from Ishihara Market and ate at a picnic table across the street. 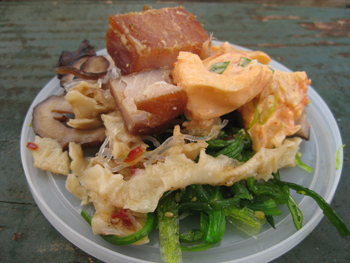 Above is a container of tuna poke. This, I believe, was smoked with some very light flavoring and was the favorite of our group. 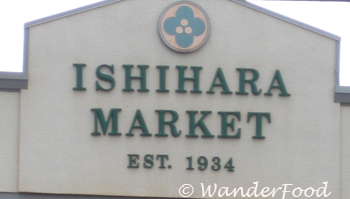 Ishihara isn’t hard to find. It’s right along the main highway in Waimea on Kauai. When you stop in, just pop into the back of the store where the deli is and choose from the many options.